Making new habits or breaking old ones doesn’t happen overnight. According to the Huffington Post, it takes 66 days, and a whole lot of effort, to form a new habit. The good news is that just because you skip a day or lapse doesn’t mean new habits won’t stick and you have to start all over. We challenge you to start making small changes associated with your eating habits so they become second nature. Provided are seven tips to get you started. Some may already be part of your routine. Others may be more of a true challenge. But if you stick to these concepts, the rewards will be well worth the effort, and you may just find that others facets of your life also reap the benefits from improved willpower, heightened energy levels, and greater mental focus. Why: You’ve just come off an overnight fast and your body needs energy to start the day. Compared to “skippers,” breakfast eaters tend to weigh less, have a greater nutrient intake, and perform and concentrate better throughout the day. Plus, going too long without eating makes us ravenous and more likely to overindulge in the wrong food choices when we finally do have the chance to eat. How: Some of us just aren’t breakfast people, I get it, but I challenge you to look at the meal you eat before bed and the timing to determine if that might be the reason. If our meals are heavy in the evening hours or fall later at night, we might not be as hungry in the morning. Instead, flip your day and start with a hearty breakfast and go lighter as the day goes on. This way, you satisfy your morning appetite have energy needed for the day ahead. Don’t have time for breakfast? Grab a piece of fruit with cheese, enjoy last night’s leftovers, or throw a Zone Nutrition Bar in your bag. Why: By making sure each meal has the right balance of protein, carbohydrate and fat, it allows you to keep blood sugar levels stable throughout the day. 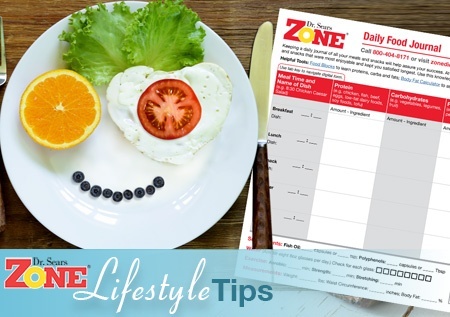 By following this Zone-type of eating plan, it can help you think, perform, and feel better since your brain has a constant supply of energy. Plus, you’ll be less cranky and moody. If you continue this balance long-term, you’ll see changes in your body composition so you’ll look better too. How: Simply divide your plate in three equal sections. Add lean protein about the size and thickness of the palm of your hand on one-third of the plate. Fill the remaining two-thirds of the plate with low-glycemic-load fruits and vegetables and a dash of heart-healthy fat (e.g. olive oil).You need about 25 grams of protein per meal for optimal satiety. Explore our Zone recipes, all which are perfectly balanced, so you are never hungry or fatigued. Why: You’re only as hormonally strong as your last meal. Eating consistently throughout the day with three meals and one or two Zone snacks ensures that you’re stabilizing you blood sugar levels. You’ll know you’ve done a good job balancing your meal if you can go 4 to 5 hours between means without hunger and fatigue. How: Make a mental note or set a timer occasionally 4 hours after a meal, or 3 hours after a snack. If you are hungry with poor mental focus, your previous meal might have been too heavy on the carbs. If you are hungry but with good mental focus, your protein might have been too high. If you don’t have significant hunger at 4 hours, then you had the correct ratio of protein to carbohydrate at that meal. *Need some help? Zone PastaRx is our patented protein-rich food designed to stabilize blood sugar and satisfy hunger for up to 5 hours. Our pasta recipes are perfectly balances, and can also help you increase lean body mass. Why: Water is critical to keeping our body temperature regulated. About 80% of our fluid intake comes from drinking water and beverages, including caffeinated beverages, with the other 20% through foods. Studies have shown that drinking 16 oz. of water before a meal actually curbs our intake of food at that meal.Based on the Dietary Reference Intakes (DRI), women should consume about 11 cups of water each day from both food and beverages, while men need approximately 16 cups per day. How: The task of drinking that much fluid may seem daunting. Keeping a water bottle on your desk, in your bag, or with you at all times is a good reminder to drink fluid. Each time you get up from your desk or an activity, use that as an excuse to grab a quick drink. If you are struggling to reach your fluid intake, you can always set a timer – or even go as far as purchasing a bottle with a built-in timer that remind you it’s time to drink up. Why: To get all the anti-inflammatory benefits of the Zone Diet, you need to couple your diet with the anti-inflammatory supplements OmegaRx2 and MaquiRx. The omega-3s in OmegaRx2 help to resolve inflammation that can be induced by our diets. The polyphenols from MaquiRx have anti-oxidant and anti-inflammatory properties to further enhance these benefits, plus have anti-aging benefits. How: Take your supplements at the same time each day to create a routine. Keeping them on the counter, on your desk, or in plain sight view may help to ensure you are getting the benefits you need. Why: Taking a personal timeout during your day to exercise, participate in stress-reducing activities, or even meditation can do wonders for your stress levels and overall well-being. How: Take a walk on your lunch break, find a gym close to the office or home where you can escape on a lunch break or before starting your day, walk to your co-workers office instead of e-mailing, or take a few minutes each day to focus on your breathing or detach from technology. Log your time so you can see your progress. Why: Forming new habits takes time but if you have the right tools you can set yourself up for success. Studies show that individuals who keep a journal or log of their activities are more successful in sustaining new behaviors. How: You need grand plan as to why you are making these changes in order to get you focused. 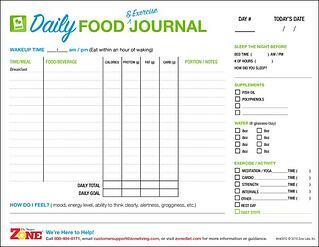 To aid in your success, consider using the Zone Food Journal to help you with accountability. Each of the tips above are easy to check off your list over time. Whether you have a good day or a bad day, continue logging, as sticking with routine and repeating good behaviors creates habits that stick. Start slow. Take our daily challenge and you might just surprise yourself. You are going to make mistakes, but you are only one meal away from getting back into the Zone . Need additional recipe ideas? Check out Dr. Sears' book, Zone Meals in Seconds. It's a great starting point. How Long Does It Actually Take to Form a New Habit? (Backed by Science). Available at: http://www.huffingtonpost.com/james-clear/forming-new-habits_b_5104807.html. Accessed: March 28, 2017.